Preheat oven to 350. In a large bowl place ALL ingredients. With electric mixer blend on low speed, then mix on medium speed for 1 minute. Pour batter into a greased bundt or tube pan. Bake for 45 to 55 minutes or until done. 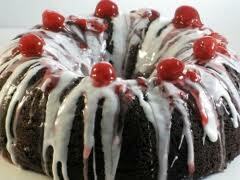 Cake is done when top springs back to touch or when a toothpick is inserted and comes out clean. Cool slightly in pan and then invert onto a serving plate. Pour glaze over warm cake. Spoon any excess glaze from plate back onto cake. Garnish with maraschino cherries.